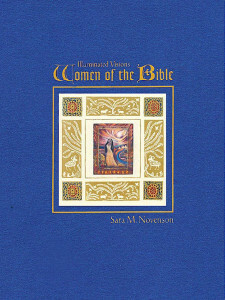 Sara Novenson is well known for her Jewish folk art and Women of the Bible series of limited edition prints. Since 1992 she has lectured and taught in synagogues, churches, museums and organizations (including Hadassah) throughout the US and Europe. This blog will address Sara’s personal journey as a Jewish woman and artist, and how and why she began the body of Jewish work, how her spirituality has affected her art, and how it has all amazingly come full circle, and more! What, you may ask; does a Jewish woman artist’s father’s tallit have to do with her art and her series of the Great Women of the Bible? I myself had not thought about this until last Tuesday after speaking to my fantastic art photographer Wendy McEhearn. I had called to ask her to shoot my milestone project, a limited edition box set of my Women of the Bible containing their stories and several short stories I had written. This project is a culmination of 10 years of studying, painting and writing. “Do you have a prayer shawl she asked?” Wendy McEhearn as you can tell by her name is not a Jewish woman. At this moment an emotional shock went through my psyche and body. It was one of those out of body moments. “The only prayer shawl I own is my father’s tallit.” “Bring it along to the shoot” she answered casually, having no idea how I was overcome with emotion. My mother gave me my father’s tallit after his death. I have always treasured it, bringing it out only for the high holy days when I wear it to honor his beautiful memory. Now I had an even greater way to honor my father. I would have my milestone project photographed on his tallit. DESPITE the fact that my father was a man, he carried the traits of the Great Women of the Bible more so than many women I know. He had the power of prayer and faith of Hannah, the fullness of the love that Rachael carried, the closeness to G-d that Sarah embodied and the great generosity of spirit that emanated from Rebecca . My father sent me to craft classes from the age of four, the Art Students League in the summers of high school (we lived nearby, I took the subway), and the School of Visual Arts in NYC for my BFA. He was an artist in his own right. He stretched my canvases for me, framed my art, and together we went shopping for my first easel. My fondest memory of the synagogue as a child (truthfully there are few) is sitting beside my father as he sang the psalms with joy in his voice, an aura of love and faith surrounding him (like Sarah) draped in his tallis. When the children’s services were over, I was proudly welcomed in the seat he always saved for me beside him. I have been blessed with a life full of mystical synchronicities, precognitive dreams and full circles. When I finally saw the finished photo of my Great Women of the Bible Book sitting on my fathers tallis, I was moved to tears. It is an offering to his beautiful and gentle spirit. An offering of love and gratitude that I was fortunate enough to have had a father who himself embodied the spirit of the Women of the Bible. If it were not for him the project would never have actualized. It was perfect. Men who embody the traits of the Great Women of the Bible still do exist. I found one. We have been together for many years. He creates my gold leaf frames with the very same tools my beloved father used to frame my art.